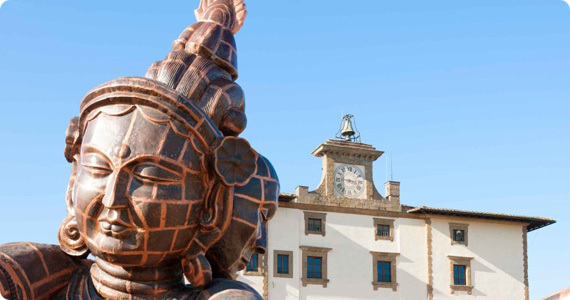 The Forte di Belvedere has finally reopened its doors today with a special exhibit dedicated to Zhang Huan, a Chinese artist prominently present in today’s contemporary art world. The exhibit is actually divided in two of the main symbols of the city: Palazzo Vecchio and the Forte Belvedere. The pieces on display showcase the artist’s reflections between great masters of the past such as Donatello, Michelangelo and Vasari after his stay in Florence with today’s experimentation between worldly and spiritual affairs. The show, amptly named “Zhang Huan: The Soul and Matter“, marks the great reopening of the Forte, symbol of contemporary works in Florence after having hosted artists such as Henry Moore, Fausto Melotti, Mimmo Paladino, Mario Merz, Giuseppe Penone, Anish Kapoor and Folon.